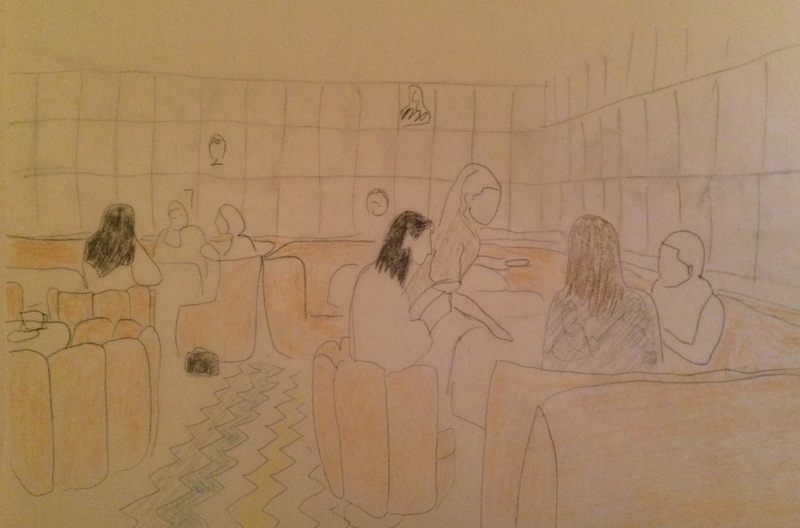 I was initially attracted to Sketch on hearing that the Glasgow-based artist David Shrigley had recently redecorated the dining room in a kitsch blancmange style and had produced a new set of drawings for the walls (293 in total) – it is a very impressive sight and needs to be seen to be believed. Sketch has always had artistic leanings, initially showing work from the Victoria Miro gallery and latterly having artists including Martin Creed redesign the dining space. Sketch is situated in a grade II listed townhouse in Mayfair and opened in 2003 after the building was completely restored by owner Mourad Mazouz. He also runs Momo, a North African restaurant few minutes’ walk from Sketch as well as a series of successful bistros in Paris. Sketch opened amidst much press hype and was at one time the most expensive restaurant in London, attracting celebrity clientele including Bill Clinton and the Beckhams. The menu has always stayed true to “New French” cuisine, but thankfully the prices have come down since its initial diamond encrusted years. 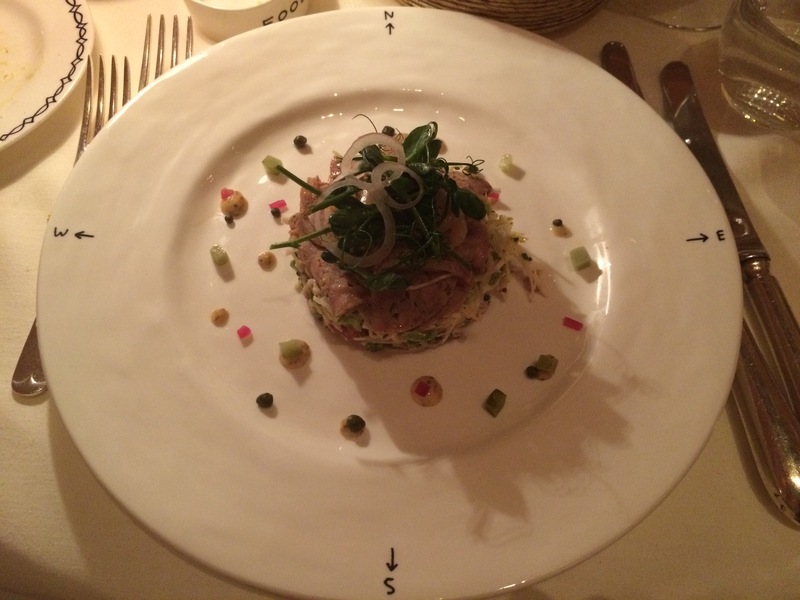 The menu is fairly curt, spanning two short pages with starters at £12-27 and mains £18-45, it is quite seafood heavy, including tuna sashimi, sole meunière and the interesting sounding blue lobster with mascarpone (albeit this is the most expensive item on the menu). I started with a pig’s ear and hock salad sitting on a celeriac remoulade. The pig’s ear had been boiled, reconstituted and thinly sliced – it was very light and soft with a surprisingly subtle flavour. The celeriac was earthy and added bitterness to the mayonnaise and shallots in the salad – a simple but pleasing dish. For main course I had suckling pig with bok choi which came sitting in a blood sauce thick enough to paint girders with. The meat was tender and slightly fatty but packed with flavour, however the rest of the dish was disappointing – the sauce was overseasoned and far too dense, the dish was overly heavy and unbalanced – it needed some greenery to lighten things up. Service was mixed – it was extremely friendly and attentive at first but then shaded off quickly through the meal; we almost came to blows with a sniffy French waiter who told us that were not allowed to walk round and look at Shrigley’s artwork during service. 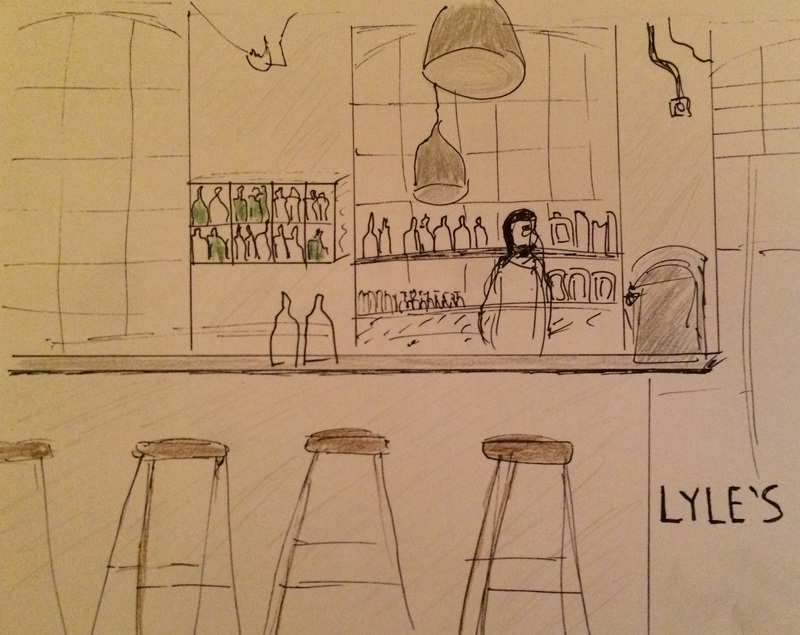 Lyle’s opened in the spring of 2014 and received lots of critical attention, mainly because head chef James Lowe has good pedigree, having previously worked at St John bread and wine. He also catered for numerous hipster bars and pop-ups as part of the Young Turks collective. Lowe started cooking relatively late in life at 23, learning his craft at La Trompette in Chiswick before joining the St John empire and rising quickly through the ranks. 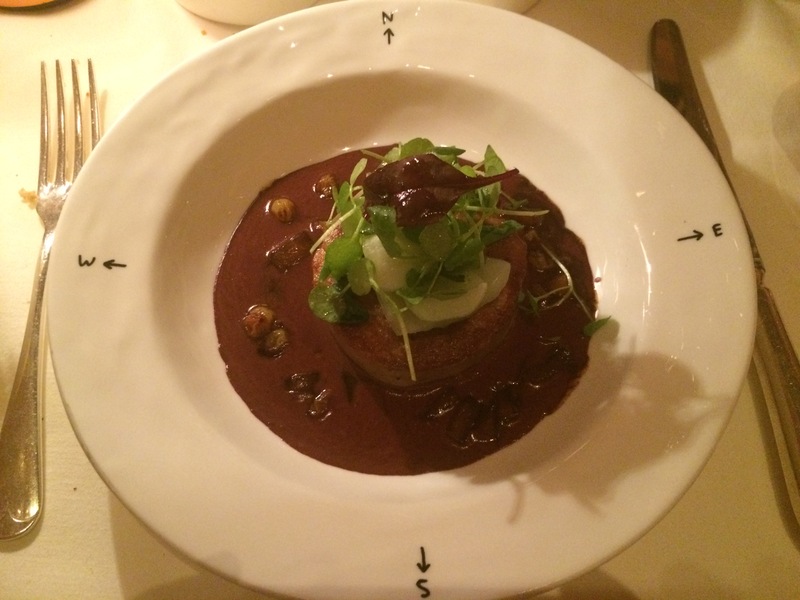 He has brought some familiar St John’s dishes to Lyle’s, including gull’s eggs and black pudding “blood cake”; they also buy their animals whole and butcher them in house. However, the critical reaction to Lyle’s has been mixed, with many complaining that the evening set menu is restrictive and unfortunately Marina O’Loughlin’s refined palette did not enjoy Lowe’s nettle soup. Lyle’s did get a good write up from Chris Pople and I was keen to see whether I agreed with him. The restaurant is housed in Shoreditch’s tea building opposite the box park and Shoreditch High Street station; the interior is cool, exuding understated elegance from the whitewashed walls to the sleek wooden and metal furnishings. We went along for lunch where the menu had a choice of 6 starters (£6-7.5), 3 mains (£10.5-16) and 3 desserts (£6-9.5). 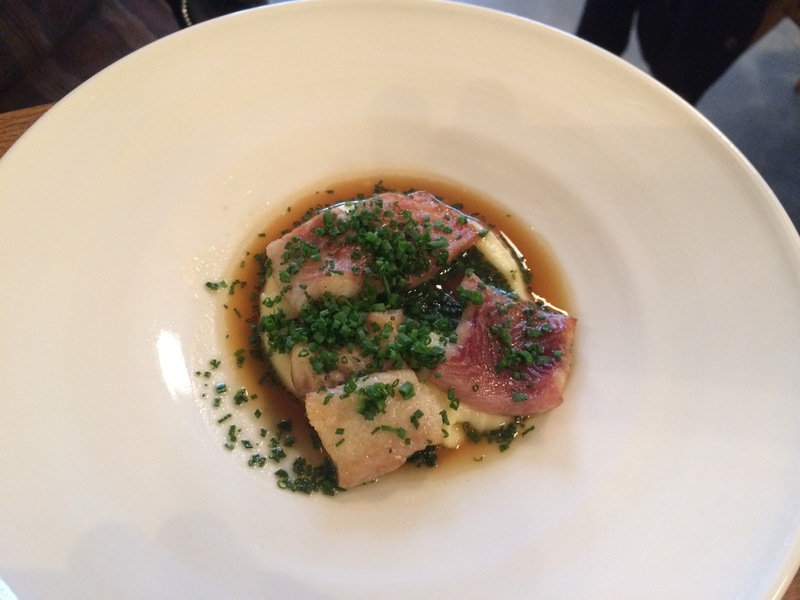 We started with smoked eel and mashed potato – the fish was light and fresh, without a hint of muddiness and the slight smokiness added depth of flavour. The creamy mash had a near perfect constitution and was served piping hot – a wholesome and incredibly satisfying dish. Ox heart and brussels tops was equally pleasing, the sprout leaves were a fantastic deep green colour and were cooked so that they retained a slight crunch leading to bitter, earthy flavours. The ox heart melted in the mouth and was still moist yet firm. Our final starter was crab and salsify bisque which was frothy and light but retained a deep crab taste; thinly sliced salsify and white crab meat lended texture and interest. Our first main course was saddleback with pumpkin and cavolo nero (black cabbage) – the generous chunk of saddleback loin had I think been prepared sous vide so that it was cooked through but still soft, the meat had lots of character but was lacking a bit of texture, maybe it should have been finished in the frying pan for a bit longer. The pairing of the meat with the crunchy cabbage and sweet, creamy pumpkin was perfect and the dish nicely balanced. 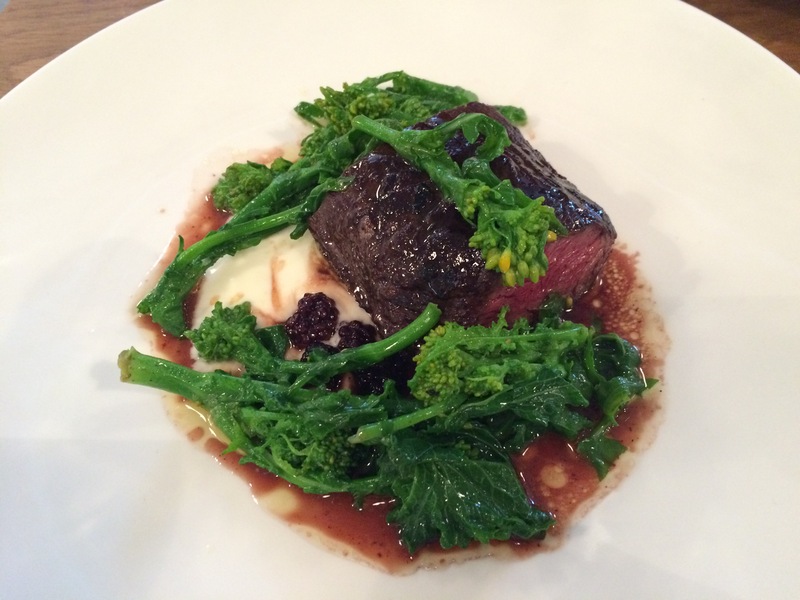 Our final dish was venison with yoghurt, pickled blackberries and tender stem broccoli. The meat was again exquisitely cooked and the broccoli lent crunch to the dish; the blackberries were tart and not quite to my taste, but the combination of sauce, yoghurt and meat worked very well. 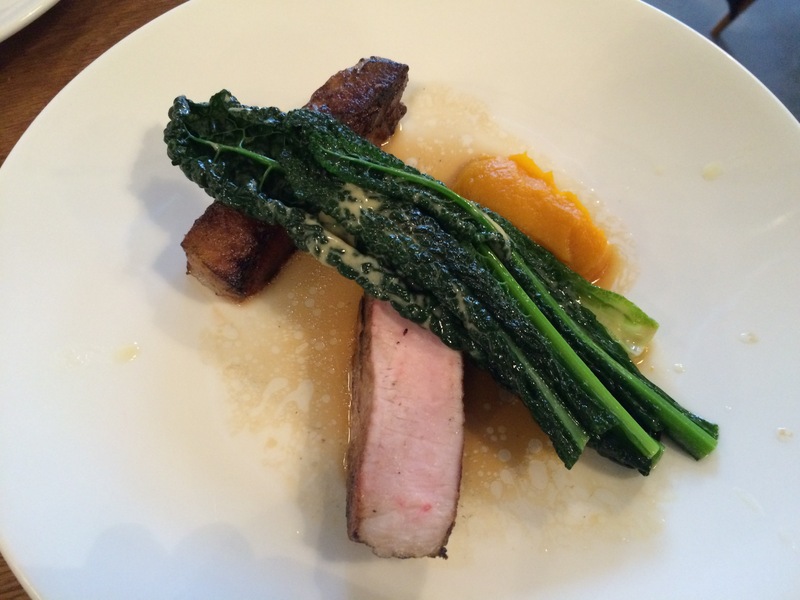 Another simple but well conceived dish. Categories: British, French | Permalink.